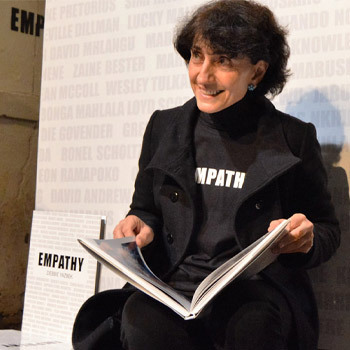 Debbie Yazbek grew up in Klerksdorp in the North West province of South Africa, third born to Lebanese migrant parents. Between 1981-1984 she studied photography at the Natal Technikon, majoring in advertising. After qualifying, Debbie left for the UK to work as a freelance photographer. At the end of 1985, with South Africa in a state of turmoil, she felt the need to return home – as democracy was unfolding. In April 1986, whilst on location assisting an advertising photographer, she found herself caught up in what was to be known as the Wild Coast Sun casino bomb blast. Bearing witness to the resulting death and mayhem, she realised that history was being written, and that she wanted to record it for future generations. Her first job on this new trajectory was as a junior photographer for the Financial Mail magazine. Two years later she was at the Sunday Star newspaper, part of the Independent Media stable, which was then one of the country’s most influential media groups. As a woman, it was clear from the start that photojournalism was a field dominated by males – however, this didn’t deter her. It simply made her more resolute. Nine months pregnant and determined to record a crucial turning point in South Africa’s history, she found herself documenting the immediate and dramatic aftermath of ANC leader Chris Hani’s assassination in 1993. Debbie went on to became the first and only woman recipient of the coveted Press Photographer of the Year title – she won it twice, in 1998 and 2003. Four years after starting her career in journalism, she went on to become Chief Photographer of the Sunday Star in 1991. Debbie proceeded to head various titles at Independent Media in Johannesburg, becoming the first woman in those positions. In 2005, she was appointed pictures editor of The Star, the group’s flagship newspaper. A turning point in her career came in 2003, when the AIDS epidemic was at its worst. The country’s leaders were in denial, and anti-retroviral medication was not administered freely in state hospitals. Millions of people were infected. With this as the backdrop, Debbie initiated a journalistic project documenting two women infected with the disease, following them to their graves in an attempt to personalise and demystify the illness. Later in 2003, Debbie won the Nat Nakasa Award for Courageous Journalism making history by being the first photographer to walk away with this prestigious award that recognises integrity, fearlessness, courage and determination in journalism. In 2005, Yazbek was commissioned to do Nelson Mandela’s official portrait. She went on to become one of his trusted photographers – whenever Madiba was to be photographed she was summoned to the task. This continued until he became too frail to greet his visitors. After 16 years of bearing witness to human suffering, Debbie realised she had PTSD and could no longer deal with what she was exposed to at work. At the end of 2005, she left photojournalism to pursue a career as a freelance photographer. She has since been working for corporate clients, NGOs, State Owned Enterprises and travel publications. Her focus is now predominately on portraits, corporate social responsibility, events, food, building interiors and exteriors, documenting every day life and whatever else catches her eye. In 2016 she published Empathy, a book about homelessness. It was prompted by an incident she photographed in 2004 of a homeless man who was left to die on the streets of Johannesburg. The paramedics didn’t attend to him because they said he was too dirty. The book focuses on homeless people, giving them dignity and most importantly, names. 1998 and 2003 Press photographer of the year (only woman recipient). 2003 First photographer and woman to win the Nat Nakasa Award for Media Integrity. First place photographic section, CNN African Journalist of the year. 2006 Exhibited jointly at the Creating Aids awareness campaign held in Holland, Toronto and Washington. 2007 Exhibited jointly at the UN Climate Change Conference held in Bali. 2009-2011 Preferred photographer for Nelson Mandela. 2012 Exhibited jointly at the Control Arms Campaign put together by Oxfam, displayed in New York. 2016 Empathy Photographic Coffee table book on Homeless People.